When Jesus Christ, our King and Master, taught us how to pray to His Father and Our Father, he used the phrase “thy kingdom come, thy will be done, on earth as it is in heaven.” In heaven God’s will is perfectly accomplished, but here on earth, fallen mankind cannot fulfill God’s will without the constant assistance of sanctifying grace communicated to the world through the sacraments of His church. After the fall of Adam, a world perfectly ordered to God’s divine will was corrupted and dis-order became the ‘natural’ state of mankind and the created universe. It was the role of the Messias to re-order this fallen world—to bring a new state of order to the world His Father had created. The means for establishing that order by which a fallen world may return to God is the Catholic church and the life of sanctifying grace. As Christians newly born into the life of grace—a ‘supernatural’ state of being—we are all called to bring as much order to this world as is possible, all the while never forgetting that this world is in a fallen and corrupted state and that a ‘utopia’ is not possible here on earth. The Church of Christ is constantly opposed in this mission by all of the forces of ‘naturalism’ or dis-order, that is those forces opposed to the supernatural life of divine grace. It is the duty of all Christians of the Church Militant to battle against these forces. This calling of Christians to the battle for order was the motto of the pontificate of Pope Saint Pius X. That motto was Instaurare Omnia in Christo, “to restore all things in Christ”, taken from Saint Paul’s letter to the Ephesians 1:10. The modern popes have frequently warned us of the dangers of ‘naturalism’, which denies the supernatural life of grace and militates against it, and they have called us to fight in our private and public lives against this pernicious error. No priest has heeded that call and risen to defend the supernatural life of grace as clearly and as vigorously as Father Denis Fahey. He truly understood, and explained why, there is no salvation outside the Catholic church, either for individual persons or for the life of society and of nations. A clear image of just what the life of a Christian in a society imbued from top to bottom with the social principles of Christ the King would be like, is not a widely shared understanding in much of the Christian world today, especially in America. We must remember that Christianity is a religion of world conquest! We are called to conquer the world for Christ and to do all that we can to subdue persons and nations to His will. A Catholic undertakes this battle first within himself and then within his family. Soon the influence of many families begins to pervade the community and then the nation or state. If Christian people do not have the full picture in their mind of exactly what God’s Plan for Order in this world would look like in its accomplishment, then they can have no long-term strategy for victory and little hope of achieving it. We have all of the tools required and all of the powers of heaven backing us. Let us take into our hearts and our minds the full plan and its potential for the realization of peace in the world and Christ the King of heaven and earth will bless our efforts. This was the permanent admonition of Fr. Fahey. “When in Rome I began to realize more fully the real significance of the history of the world, as the account of the acceptance and rejection of Our Lord’s Program for Order. I used to ask permission to remain at the Confession of St. Peter, while the other scholastics went round the basilica. “I spent the time there going over the history of the world, and I repeatedly promised Saint Peter that if I ever got the chance, I would teach the truth about his Master in the way he and his successors, the Roman Pontiffs, wanted it done. Father Fahey not only clarified, explained, taught, and defended ‘Our Lord’s Program for Order’ in the world, he also actively fought and exposed the persons who were the enemies of that order. Because he did so, he has often been called ‘negative’ or ‘anti-Semitic’, or ‘much too concerned with Masonic conspiracies’. These are the pathetic terms of opprobrium hurled with such energy by those enemies of Christ whose plans he has effectively opposed. But in this he was in good company with St. Louis Marie de Montfort and Our Lady, who appears ‘terrible as an army set in battle array’ to the enemies of her divine son. Listen to the words of St. Louis Marie as he stresses the two functions of our Blessed Mother, the positive one of making Our Lord known, and the negative one of making war upon His enemies. Mary must be manifested more than ever by her mercy, her power and her grace in these latter times; by her mercy, bringing back and lovingly welcoming the poor strayed sinners who will be converted and will return to the Catholic Church; by her power, against the enemies of God, idolaters, schismatics, Mohammedans, Jews, and men hardened in impiety, who will rise in terrible revolt to seduce all those who oppose them and to make them fall by promises and threats; she must also be made manifest by her grace animating and sustaining the valiant soldiers and faithful servants of Jesus Christ, who shall battle for His interests. And lastly, Mary must be terrible to the devil and his ministers, as an army in battle array, principally in these latter times, because the devil knowing that he has but little time, and now less than ever, to damn souls, will every day redouble his efforts and his combats. He will before long raise up cruel persecutions and will lay terrible snares for the faithful servants and true children of Mary whom he finds more difficult to conquer than the others. Loreto Publications has re-issued all of the previously published works of Fr. Fahey and making them available to a much wider audience. The works of Fr. 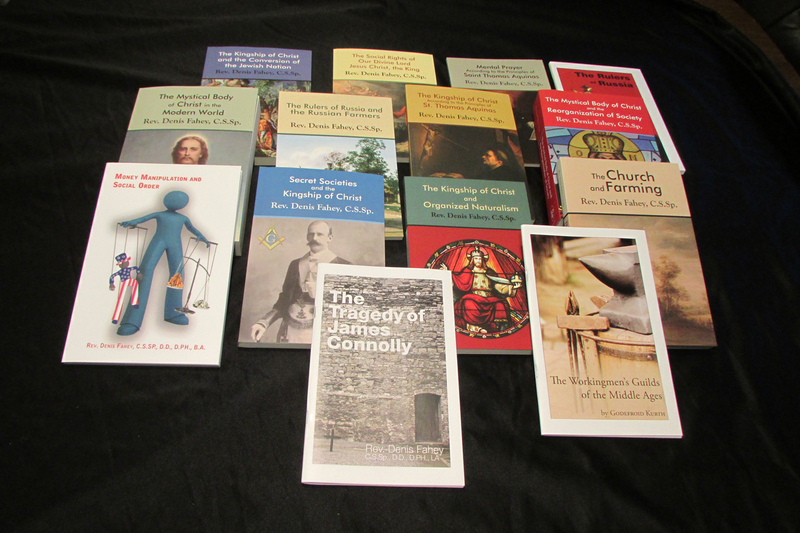 Fahey are critically important for Catholics to read, understand, and disseminate in our day when the forces of ‘organized naturalism’ or ‘anti-supernaturalism’ seem to be rampaging triumphantly through the Church and the world today. Arm yourselves for the battle!